> Why are you onemonkey? Monkeys are our friends, monkeys are fun, monkeys monkey about, monkeys don’tgrow up, monkeys don’t have jobs, monkeys are what we were. 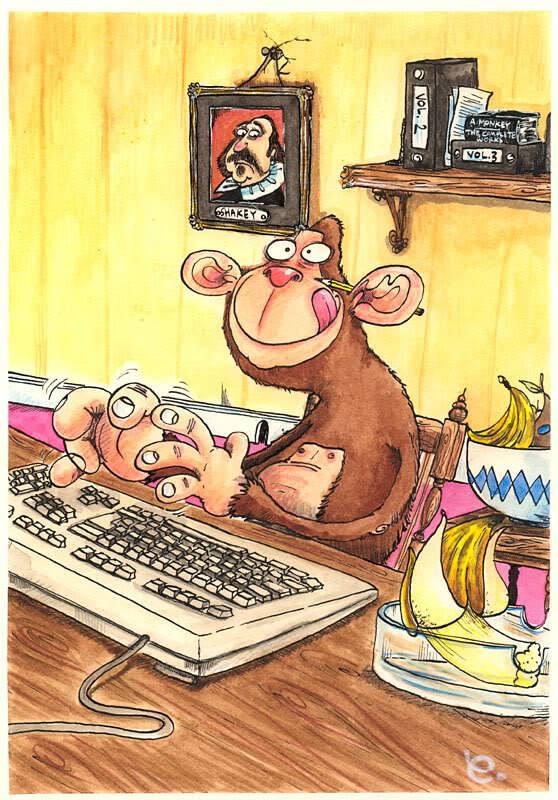 My pseudonym and domain derive from the well known theorem which states thatgiven an infinite number of monkeys banging away on an equivalent number oftypewriters eventually one of them would produce the works of Shakespeare. Inand of itself not terribly interesting hypothesis, but I was inspired bysomeone’s suggestion that the internet seemed to be a practical version of thisexperiment that was actually proving the opposite. (This is the point of theequation at the top of my page.) I am one of those monkeys banging away almostrandomly on his keyboard. Them apes are more like us than most people realise or are willing to admit. Iencourage you to read about the apes that were taught sign language, theirstory does a lot to undermine human egocentricity and misplaced arrogance abouthow special or unique we are within creation. I think the monkeys are more central to unravelling our own condition. Charlie Darwin was ahead of thegame on this one..